A dual purpose brushing system that is ideally suited to either a sand or rubber crumb maintenance programme. Comprising of a pair of oscillating brush units, the OSCA 3 allows for periodic aggressive brushing to be undertaken to agitate the upper infill level helping reduce compaction, encourage fibres to stand upright and reduce the risk of contamination and surface water. By switching off the pto, the brush system can be used as a conventional dragbrush for the more regular light brushing programme to help stand up the fibres and to move the infill around to create a level surface. Moving the infill around through a brushing programme helps to minimise the threat of moss and algae. Dan Shemesh, Director of Stadium and Training Grounds for the New York Red Bulls has praised the SISIS Osca 3 which maintains the synthetic turf on one of the club’s training fields. Andy Jackson, grounds manager at Stoke City FC, has reported ‘phenomenal’ results since incorporating the SISIS Osca tractor mounted oscillating brush into his synthetic surface maintenance programme. William Watson, head groundsman at Hamilton Academical FC, believes that his SISIS Osca has helped the synthetic pitch at the Superseal Stadium stand up to the rigours of an extensive amount of playing time. The common misconception is that synthetic surfaces are maintenance free. Just like natural turf surfaces, synthetic surfaces require maintenance as soon as they are constructed if they are to perform to the standard expected of them. Regular and periodic maintenance is required to ensure that the playing surfaces achieve their full life expectancy. St Georges Park, the FA's National Football Centre, was recently awarded the Institute of Groundsmanship's (IOG) Best Maintained Artificial Pitch of the Year. It was a great achievement for head groundsman Alan Ferguson and his team, who have acknowledged the SISIS Osca as being integral to winning the award. 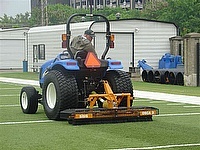 A synthetic playing surface often gets more use than a natural one. It is therefore imperative that Groundsmen should have a regular brushing programme, suitable for the area and usage. A programme of light brush between play, and now and again a more intense brushing to stand the pile or fibre up, is recommended. 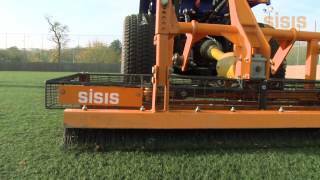 This video shows the SISIS Osca 3 in action showing its suitability for synthetic and artificial turf maintenance. 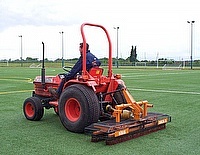 The SISIS Osca 3 is a tractor mounted powered oscillating brush which is equally effective on natural and synthetic turf for sports field, and amenity maintenance.